I find it most peculiar that the article would lead with that "mini-skyscraper" comment. No need to get in a huff, Colwooders. It's not really a tall building after all. It's just a "mini-skyscraper." What the heck does that even mean? Is it yet another bizarre example of Victorian self-deprecation? As if suburbs like Colwood tend to be full of tall buildings or something? If it was in downtown Victoria it would be a "looming edifice that will dominate the skyline and leave the streets in shadow"... :? So mini that it'll stand taller than the 24-storey Hudson tower (at 72 meters vs Silk's 77 meters). So this will be the tallest building on the island then? Yeah, you're right! Odd that at 23-storeys it's taller than a 24- and 26-storey condo. Edit where is the 77m info from? The article with the rendering in it. The website for Silkwind is now semi-live and features a new rendering. At SilkWind, experience the epitome of new West Coast style in one of Victoria’s most scenic, historic neighborhoods, West Shore. This Merrick-designed architectural masterpiece, featuring 150 condominium homes, soars above the city, beaches, parks, forests and miles of trails, including the famous Galloping Goose. Savour views of the Olympic Range, Mount Baker, the Pacific Ocean and Royal Colwood Golf Club. Ultra luxe suites have been created with exquisite and spacious interiors (from 1,058 square feet) and the most impeccable attention to detail. "West Shore" is a scenic, historic neighbourhood? That condo-tron machine is really workin' it. Should be a nice building but I wish there was some variation in the floorplates along the way. Some curve or angle that extends only part of the way up, or some unique details on the uppermost floors. You know what I mean. Edited by aastra, 07 November 2017 - 07:12 PM. It bugs me how these wide-angle renderings always make the building look more angular and bold than the design actually is. I love the big bland patch of grass around the edge. Yeah, I think the building is quite pretty and don't even mind the monotone rise without any variation but the lack of street interaction really bugs me (even though it's something I should expect by now on the Westshore). They'll pay for this shortcoming eventually. The suburbs, will have to build some unnatractive un=pedsrian friendly towers before they realiaze they need better planning. Hi all, I've been reading the posts on this site for a while now but first post. Great site; I really enjoy visiting here! There will be a meeting of the Planning & Zoning Committee on Tuesday, July 3rd 2007 at 7:00 pm at the City Hall at 3300 Wishart Rd. in Colwood to hear the proposal and to offer comments regarding SilkWind. So what was the approval for if they're having meetings at this stage (and especially with marketing materials already on the go)? The footprint is reminiscent to an arrowhead, which is neat in a way. 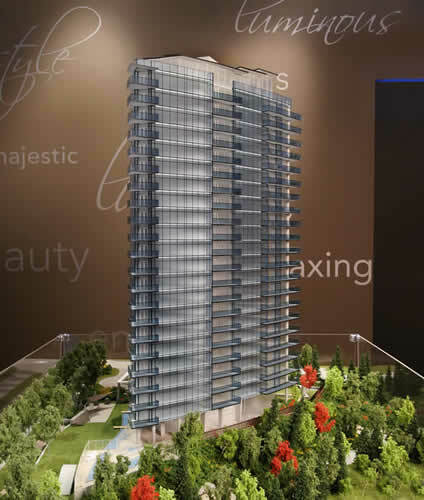 The representative for this project is the developer of Upper Harbour Place and the display suite will be located in suite 102-645 Tyee, which is right beside Westbanks The Falls display suite.